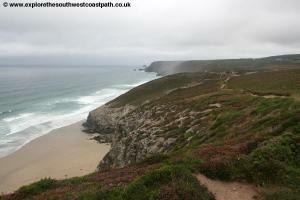 This walk is a good summary of the scenery of Cornwall. It begins from the town of Portreath, once a busy port and with a good sandy beach and heads north past Gooden Heane Cove and to the large sandy beach at Porthtowan. At the north end of this beach, overlooking Chapel Porth is the disused Wheal Coates mine, a landmark on this part of the coast and an indication of the intense mining that once happened right accross the county. From here the coast becomes more rocky as you round St Agnes head and descend to Trevaunance Cove, a sand and rock beach. Just beyond this beach is another steep mining valley and you then pass a small airfield to descend to Perranporth, with it's large sandy beach and huge dune system - a classic Cornish beach. Portreath is easily reached from the main A30 trunk road through Cornwall. Exit at the junction signed for Portreath and you come to a rather complex junction where you turn right if coming from the east or left if coming from the west onto an unclassified road into North County (it is signed for Portreath on the exit). Turn left then right onto the B3300 and follow this through Bridge and into Portreath. As you approach the harbour continue on the main road where it turns left behind the harbour and then round to the right to the beach. There is a large pay and display car park at the back of the beach, although in comparison with other car parks in the area it is quite expensive. If you prefer, and if there is space, continue on the main road as it turns away from the beach and after the public toilet on the right hand side there is free (at the time of writing) on street parking on the right hand side of the road although this is likely to fill quickly in the summer months. Otherwise there is another (free) car park on Lighthouse Road at the start of the walk. As there is limited public transport between Portreath and Perranporth (see below) you may instead find it easier to park in Perranporth and take the bus to Portreath (it runs only in the summer) and walk back, so you avoid the possibility of a long wait for a bus at the end of the walk. If you are travelling by public transport Portreath has a fairly frequent bus service. Service 44 runs hourly Monday - Saturday from Camborne and Redruth. It serves Redruth station if you are travelling into the area by train and also serves Camborne Bus station a short walk from the railway station in Camborne. In addition during the summer months bus service 547 runs 4 times daily along the coast between Newquay and St. Ives via Perranporth, St Agnes, Porthtowan, Portreath, Hayle and Lelant. This bus runs Monday - Friday and on Sundays (but not on Saturdays). For details of both services see the link below. There is a limited choice of accommodation in Portreath. There is a hotel and several bed and breakfast establishments. There are also some self-catering cottages available in the village. For a wider choice of accommodation try the nearby towns of Camborne or Redruth. The Portreath Arms Hotel is right on the sea front at Portreath and offers 7 rooms including a family room. 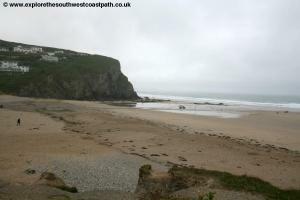 The Cliff House Bed and Breakfast is also in Portreath and has 4 rooms. Another bed and breakfast is Moor House. Finally there is also the Beach Side Bed and Breakfast. 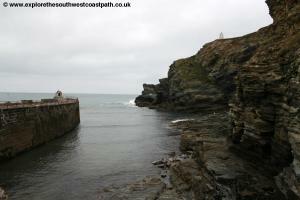 Portreath is one of the few ports on the North Cornwall Coast, with it's small harbour and harbour wall. Today the town has a good sandy beach which is popular with surfers and a fair size residential community. 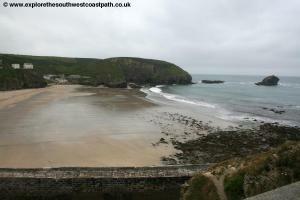 From the main car park at the beach in Portreath take the steps down at the back of the car park over a gravel and grass area to the Waterfront Inn. Once past the pub immediatly turn left into the pub car park and continue in the same direction until you reach the south edge of the harbour. Here turn right and follow the edge of the harbour until you reach the back of the harbour. Walk round the back of the harbour and then follow the harbour edge on the opposite side, now heading west. After the last of the flats on your right, turn right away from the harbour and up the steep Harbour Terrace. The harbour here once had a railway line which you can now follow to the south coast of Cornwall and it used to run along this road. At the end of this road (Harbour Terrace) turn sharply left onto Lighthouse Road. 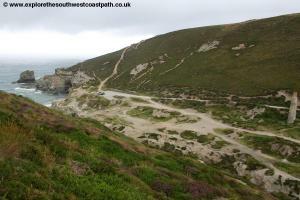 Note that the route of the coast path shown on Ordnance Survey maps has sadly been closed due to erosion so you have to follow this minor road to start with. 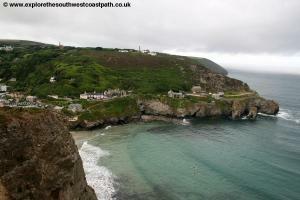 The road soon curves round and offers fine views back to Portreath and it's beach as you climb out of the town. The Pepper Pot, the white tower which was a beacon for shipping is now sadly inaccessible, as this path has been closed, but you'll see it just below the road to the left. Continue along this road past the last of the houses and shortly after there is a small car park on the left. 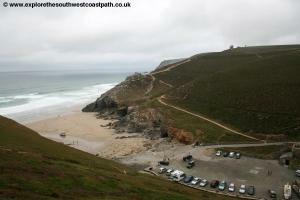 Enter this car park and at the end nearest the coast you cross from the car park onto the adjacent coast path. 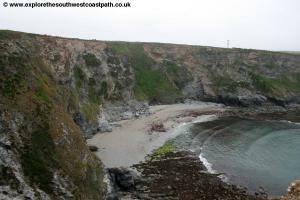 Below is Gooden Heane Cove a pleasant rocky and sandy beach but inaccessible other than by boat. The coast path soon follows the coast as it turns north around the back of this bay, passing a couple of cottages on the right. 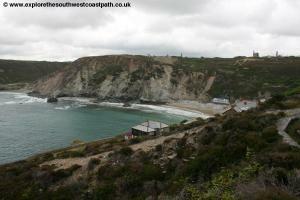 At the north end of the bay is the headland of Gooden Heane Point. 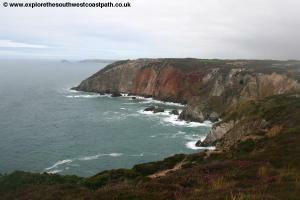 The coast path doesn't round this little headland, although there is a small footpath around it if you choose to do so. Instead, turn right on the main path now heading east. The coast path is easy to follow north now for the next few hundred meteres where you descend down a small valley (Hayle Ulla) where there is an old quarry. 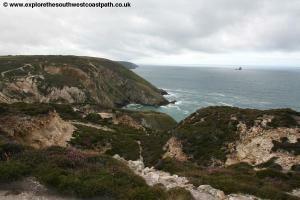 Climb up the other side and continue north on the obvious coast path. To the right is the now disused Portreath Airfield although the high fences and security signs suggest it's still owned by the Ministry of Defence and I believe it is still used on occasion for coastguard and Search and Rescue flights. A little over half a mile from the valley you come to another rocky and sandy cove (oddly unamed on the map) which you round and then come to another just beyond it (Sally's Bottom). 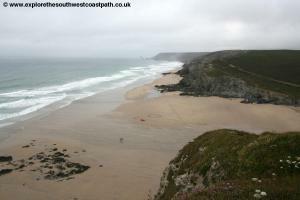 Here the path drops to a low level but you cannot (safely) get on the beach. 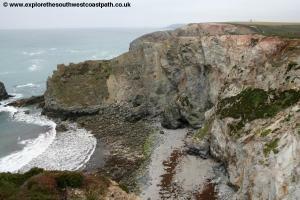 The coast path now climbs up the other side over old quarry workings (a feature of this part of the Cornwall coast) to another little headland. Ahead you turn right with the coast to some more old quarry workings. Here the main path keeps straight on beside the fields to your right and with the old quarry to your left although there is a more coastal path if you prefer and they both end up in the same place. Just beyond the quarry a path leads to the right inland, but ignore this and keep to the main coast with the sandy beach of Porthtowan now ahead of you. 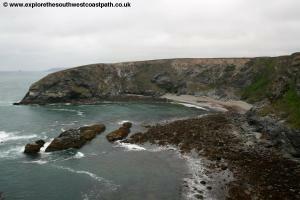 There is a small beach to the left accessibly only at low tide by crossing the rocks from the main beach. Continue until you have the main beach ahead. The beach at high tide is quite small, but at low tide it's much wider and with the spectacular rocky cliffs, it's a beautiful beach which, like most on this coast, is popular with surfers. 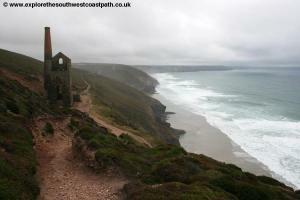 You now keep on the wide track ahead leading to the headland above the beach, where it becomes a road and descends down. 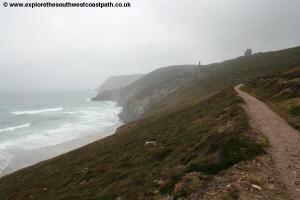 At the end of the headland there is a choice of routes. The official (and much easier) route follows the road around until it joins West Beach Road however there is a steep path along the cliff edge leading directly down to the beach. The choice is yours. Once in West Beach Road turn right passing the Unicorn Inn on your left. On reaching the main road ahead (where there is a bus shelter) turn sharply left into it, passing the village hall on your right and the gardens beyond. The road leads into the car park and you continue along the road, passing the car park on the right (where there are toilets). Continue along the back of the beach, past The Blue Bar to the right and then along the wide track that climbs away from the beach. 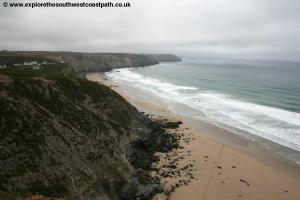 Keep to this path as it follows the coast heading north and continues to climb. 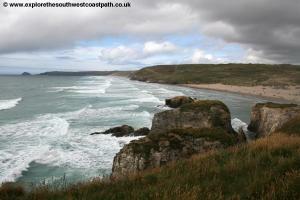 To the left at high tide you have sea, but at low tide there is a sandy beach all the way along the coast here. 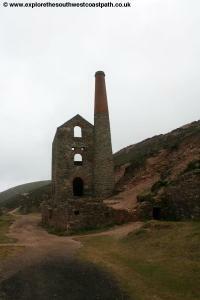 As you approach Chapel Porth there is a maze of paths as you come to some more old mine workings. 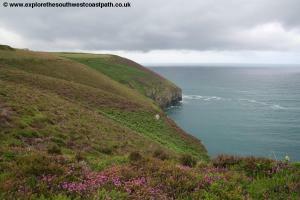 Stick to the wide path closest to the coast as it soon turns to the right and descends down to the car park at Chapel Porth. The official route is to keep to the wide path heading a little inland and joining the road and then following the road to the car park, although a shorter but steeper path has formed directly down into the car park, so the choice is yours. This small beach at Chapel Porth is now owned by the National Trust (who operate the car park) and there is also a cafe in the car park (this may not be open in the winter). The beach also has a life guard in the summer. From the car park, follow the access road out of the car park as it climbs gently away from the beach and look out for the metal "Coast Path" sign and the path leading off onto the coast path on your left (this is just before you pass the cafe). 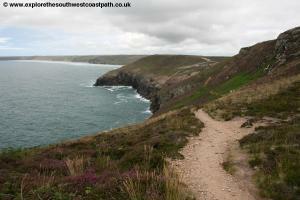 Follow this obvious and wide coast path right along the cliff top. The path soon splits into a maze of paths again as you approach another old mine. Here you take the path going left briefly down into a little valley and back up the other side, now a wide track. Keep to this until you come to the much photographed Wheal Coates mine house, where the old mine buildings still survive and you can look through the grate into the mine shaft. Just past the engine house the path splits. Take the right most path, climbing away from the old engine house and then keep ahead on this path, soon ending up parallel to a field on the right. Pass some more old mine buildings on the cliff top and when the path splits again take the left most path (the wider and nearest the cliff top). This soon comes to Carn Gowla where there is a minor road and car park just back from the cliff path. 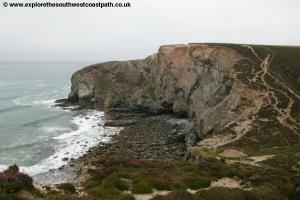 Keep to the narrower footpath along the cliff top here soon reaching St Agnes head. 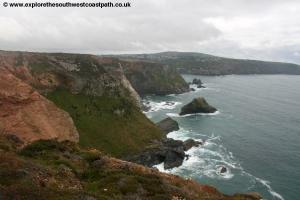 At the headland turn right, keeping with the coast, on the obvious coast path, soon rounding some fields. Keep to the main path passing Newdowns Head beyond which the path goes through more old mine workings again. 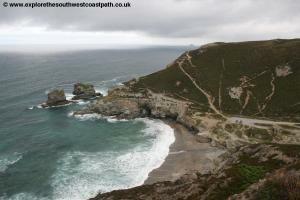 This time the path is more obvious and you keep to the main wide path closest to the coast. 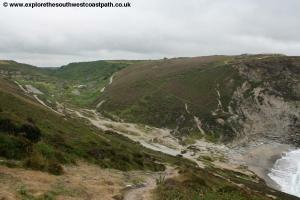 This soon becomes a minor road leading down into Trevaunance Cove. 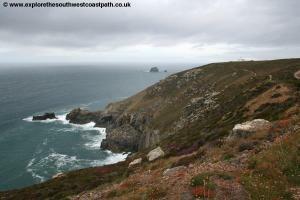 This is a village that more or less merges with St Agnes, a little further inland. Follow the minor road down to the village, passing the car park on the left. At the T-junction you can turn left for the beach, which is a small secluded cove with some sand. For the coast path, turn right along the road to the pub, Driftwood Spars. Just in front of the first part of the pub by the entrance to the beer cellar turn left and take the steps climbing away from the pub, well signed for the coast path and follow this path as it makes it way back to the cliff top above the beach. Keep the main wide track along the cliff top here. You soon round the corner into the Blue Hills Valley, so called because of the deposits from the Tin mines that were once busy in the area. The coast path soon joins the narrow twisty road that leads down to this valley and when it does so you take the part of the road going down hill into the valley. This soon descends over a little stone bridge over the valley passing the Blue Hills Tin mine (now open to the public). Follow the road as it begins to climb the other side and at the fork of tracks you take the left most track initially parallel to, but a bit lower, than the road. Follow this to a small car park at Trevallas Porth a rocky little beach. 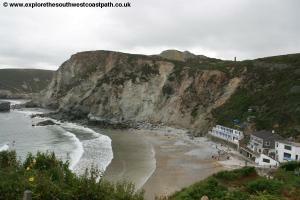 Here take the coast path from the back of the car park that follows the edge of the cliffs, soon leading up onto the cliff top. Follow the wide track around the cliffs. Soon on the right you have the small Perranporth Air field. Just around a little rocky bay far below you briefly join the surfaced track at the edge of the airport, soon returning back to the footpath. 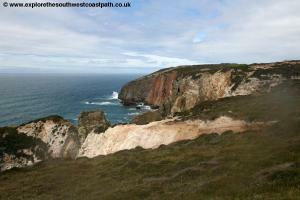 You pass the spectacular cliffs around Green Island and on to Hannover Cove. Again you come to more remains of mines and keep to the path closest to the coast, soon reaching the next headland, Cligga Head where there is another huge quarry and old mine waste. 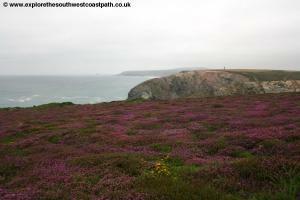 You follow the path closest to the coast over this initially rather baron landscape (I believe the soil was posiened by some of the spoil from the mines), soon back through an area of heather and gorse on the cliff top path. This passes more mine remains and then you come to Shag Rock with the beautifu bay of Perranporth stretching out ahead of you. Follow the coast path around taking the path to the right of the building at the end (a youth hostel) and soon joining the road (Tregundy Lane). On reaching the car park on the left, walk through the car park to Cliff Road below and follow Cliff Road as it leads down to the beach level and the main beach car park. The walk ends here, where you'll find toilets and the bus stop. Continue along the road to the centre of Perranporth. During the summer months, Western Greyhound bus service 547 runs three times most days to St Ives, returning via Portreath. If this is not running, or you have a long wait then you will need to use service 581 which runs hourly to Truro (except on SUndays). From Truro take a bus or train to Redruth and from there the bus back to Portreath. To avoid this complex journey if you are travelling by car you may prefer to drive to Perranporth in the morning and time your arrival with one of the buses to Portreath and then walk back to your car rather than park in Portreath. For details of the buses to Portreath and the local buses between Portreath and Redruth, see the link below. Ordnance Survey Explorer map 104 (Redruth and St Agnes) covers this area of the coast path and is available from most book shops nationwide and many local shops. 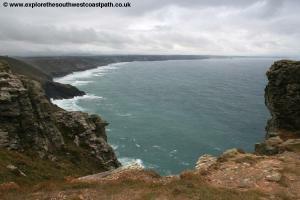 Streetmap is a web site which provides maps of the UK, including the area between Bude and Crackington Haven. 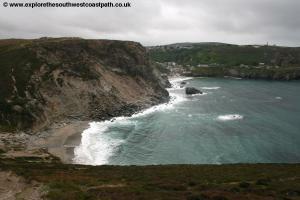 The links below cover the coast between Portreath and Perranporth.